I used to bounce around the West way more often than I do now, but that was when gas was super cheap, I didn’t have kids, and the only things that mattered to me were, Where was my next fish going to be caught and when which pub I would be visiting afterward. One of my favorite places to find that combination was in Meeteetse, Wyoming, where I would fish private and public sections of the Greybull River for native Yellowstone cutthroats. I remember catching almost 60 fish on dry flies one day on the Meeteetse and it quickly became one of my go-to streams. Meeteetse is a tiny a tiny little town with entertaining people and lots of history, plus a couple pubs with the requisite animal heads hanging off the walls. Want a true West experience? Head to Meeteetse and the G-Bull. If you do so, your timing is good—a recently finished project allows cutthroats from the lower river to access prime spawning turf upstream. Keep an eye on this river. Here’s the full story from the Billings Gazette, followed by my listing of Meeteetse as one of the top 10 trout towns in the West. MEETEETSE, Wyo. — A stretch of the Greybull River turned muddy Wednesday when crews diverted water over a new $4.3 million irrigation dam designed to reunite Yellowstone cutthroat trout with native spawning grounds upstream. At 9:30 a.m., a backhoe working against the backdrop of the Absaroka Mountains unplugged the river and sent a torrent of chocolate-colored water flowing back into the Greybull’s historic channel. The dam’s floodgates were raised and the river was whole again. Construction on the new dam began last fall when the Greybull was sent on a course slightly north of the new structure. Throughout the winter, the $4.3 million project, known officially as the Upper Sunshine Dam Rehabilitation Project, employed about 25 people. Butch Cassidy stayed here. You should, too. Let’s say you’re just fed up with the city life and you want to live where the pace is snail-slow and earning a living isn’t an issue. If that’s the case, Meeteetse may be for you. Regarding Meeteetse’s surrounding area and its fishing options, it has it all—the Wood and Greybull rivers, Sunshine Reservoir, the Absaroka Mountains and a plethora of high-mountain lakes. Wildlife abounds in the area and it’s not uncommon to see antelope, deer, elk, bighorn sheep and black and grizzly bears prowling about. If you need many social activities to keep you going, Meeteetse may not appeal. However, if the social scene isn’t an issue and you don’t mind driving 30 miles to Cody for groceries, you may want to check this place out. It’s where the Absaroka Mountains meet the Wyoming badlands. Pitfalls: If you’re the lonely type, don’t move to Meeteetse alone. There isn’t even a day scene, let alone a night scene. In Meeteetse sheep run scared. Big Ups: Some awesome native cutthroat fishing, plus wildlife and scenery galore. Best Eats: You have two options here—the Elkhorn and the Outlaw Parlor & Cowboy Bar. The Elkhorn offers the standard cheeseburger and sandwich menu, plus Rocky Mountain oysters. In addition, patrons find a full bar with pool tables and an impressive mounted head collection. The Outlaw is more of a sit down and enjoy a big dinner kind of place. It’s also where Butch Cassidy was once arrested for “borrowing” a horse. Meeteetse is the only place Cassidy spent time in jail. On the menu you’ll find homemade soups, breads and pies, along with steaks, chicken and ribs. After Hours: Pool and brews at the Elkhorn under the watchful eyes of all those mounted heads. Kick Start with Caffeine: Lucille’s offers a good breakfast and stakes claim to the “best” chicken-fried steak in the West. Meeteetse chocolatier has organic coffee and chocolates, of course. Kicking the Dirt: Head to the Elkhorn and rub elbows with local landowners, kissing up for a private place to fish on the Greybull. This entry was posted in Conservation, Northern Rockies, Uncategorized, Wyoming. Bookmark the permalink. 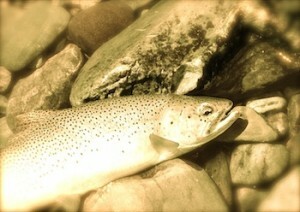 My fishing stories are posted on the Wy. Fishing Network/Fishtails. I have not visited Meeteetse in many years, and am looking for my next story. I do remember good food and a nice motel. Wyoming is full of stories. I have a guided horseback elk hunt going several miles up the greybull River. My hunt leaves on the 31st. We ride several hours upriver to elk camp. then hunt 5 days then ride out.. I would like to do some flyfishing before the hunt. Can I get help with access to private property. and maybe some pointers on catching your local trout. Sept 25th. Anyone wants to help, I’d be forever grateful. Gary. Excited to meet some of you local crazies!